"I made it because other 'similar' applications are a bit crappy (only a bit :D ), to say what I truly think." His site is dead. He left the scene about two-three years ago. It's a shame because the guy made some really good tools in his day. PSicture is one of the many graphics rippers released for the PlayStation. Trust me, PSicture is the best PlayStation graphics ripper you'll ever find. That's saying a lot seeing as how this program was released back in 2003. PSicture allows you to save a list file once you've finished scanning for data. Back when faster optical drives were more expensive this was a welcome feature. And it still is, why run the same scan the every time? PSicture also has a plug-in architecture. 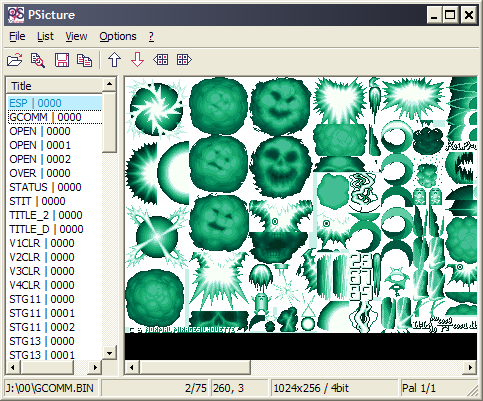 Included in the zip file are plug-ins for four different image formats. snailrush released more plug-ins separately and I'll be sharing them soon. Unfortunately, I don't believe he ever released a guide on how to make these plug-ins. Then again, he might have, my memory is vague on this. One should note that unlike a lot of other scene releases this tool is very well documented. snailrush clearly put a lot of thought into what he did. Neither the documentation nor the program look hastily put together. And that's not a crack at other scene releases, I'm just saying the hard work isn't go unnoticed. PSicture is truly is a gift to the PlayStation dev scene!